Not too long ago I played the critical darling Thomas Was Alone, and wanted to do a quick write-up about it. It’s a short game (<5 hours), befitting its origins as a Flash game on Kongregate developed at a game jam. 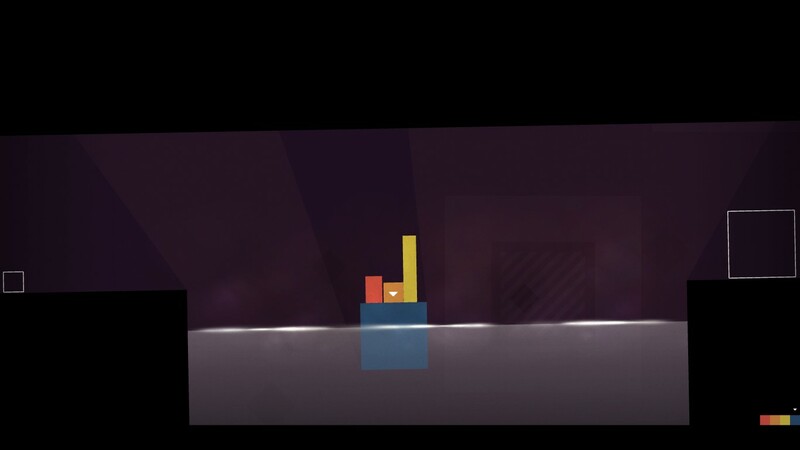 It’s a puzzle platformer, wherein rectangles navigate beautiful minimalist landscapes. The artwork is really instructive, using bold colors against black landscapes, it shows how much you can do with understated elements. Purely as a puzzle platformer, it’s lackluster at best- puzzles generally had one solution, and could usually be arrived at by iteratively testing the limited set of possible approaches. The core mechanic is that each shape has different abilities and restrictions, and you have to use them all to solve each level. That’s a great premise, and it does a good job of slowly introducing each mechanical twist to the player. There were rare moments that really did capture the feeling of teamwork the game was intended to elicit. When all the blocks are working together and helping eachother, it does feel like some sort of collectivist statement on progress. But designing puzzles like that is hard. So too often levels boiled down to either rudimentary switch and door puzzles, or focused primarily on platforming and had the characters largely operating independent of one another. Unfortunately, “Platforming Puzzle” is such an extensively explored design space, it’s very difficult to produce novel puzzles that haven’t been done before. The game was primarily praised for its characterization. With great voice work from Danny Wallace, it really does have a strangely engrossing plot and set of characters. …Sort of. In game, the ‘characters’ can do nothing but move and jump. On different levels you control different characters. Slathered on top of that is funny writing and voice-work, which somehow gives the illusion that these are good characters engaged in a good plot. It bothers me a little since it’s a trap games can’t seem to crawl out of: that the nebulous concepts of ‘plot’ and ‘characterization’ are something you put on top of the game, rather than being an integral part of it. The plot concerns itself with the spontaneous generation of artificial intelligence, a topic near to my heart. While the narrator informs us that the characters have conversations, are developing cooperation, and have an awakening awareness, it’s all just told to the viewer. We don’t see anything like that happening. It felt particularity jarring at times, because while the narrator says these exciting things are happening in the inner-life of the characters, all we everactually do is jump around. The plot essentially could be about anything, since the player’s relation to it is completely abstract. It almost feels like a Stanley Parable-style joke on the player. Since we never hear the characters talk, and our only inference to the plot at all is through the narrator, I half expected the ending to pull some meta-narrative joke like “Ha, gotcha! They’re just squares jumping around! I made you feel attached to them with mere words!” I would’ve liked that as commentary, since so much storytelling in gaming is ascribing narrative meaning to meaningless actions. Unlike its protagonists allegedly do, Thomas Was Alone has no self-awareness though, sadly.